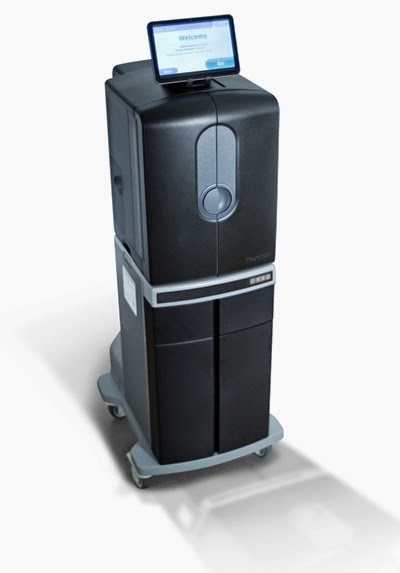 Baxter recently announced a new Home Hemodialysis machine called Vivia. The machine is primarily intended for use at the patient's home for more frequent, longer duration dialysis. Unfortunately, as always, the machine is not going to be available in India until much later, if at all. The machine is currently available only in Europe. The machine has been designed keeping the patient in mind, the website says. It has an easy touch-screen based interface with animated videos to assist with operation. One significant point I noticed was that the dialyzer and blood lines are termed as 'extended use' which means they would be reused. We, in India are used to reuse but many in Europe might frown. The scenario for Home HD is changing rapidly. More and more machines are being announced. Fresenius has a machine for Home HD that was announced recently. Then there is this from Baxter. The NxStage System One is being improved continuously. There is Victor Gura's WAK. There's also Medtronics that is developing a portable dialysis machine which can be used at home. There could be many more devices that are being developed but not yet announced. All this is great news for us dialysis patients. It is now an indisputable fact that dialysing more frequently and for longer durations is beneficial to the body. It is not only associated with a better quality of life but also with a longer life. Many like me have experienced this benefit first hand and do not need any randomised controlled trials to tell us about these benefits! More frequent, longer duration dialysis is practical only at home. Who wants to go and sit in a dialysis centre or a hospital every day for long hours? At home, the convenience is unmatched. You can dialyse at your convenience. That is why, it is important for such innovation to happen. It is important for more such devices to come out into the market. It is important for us patients to have the choice. Let the best machine win!